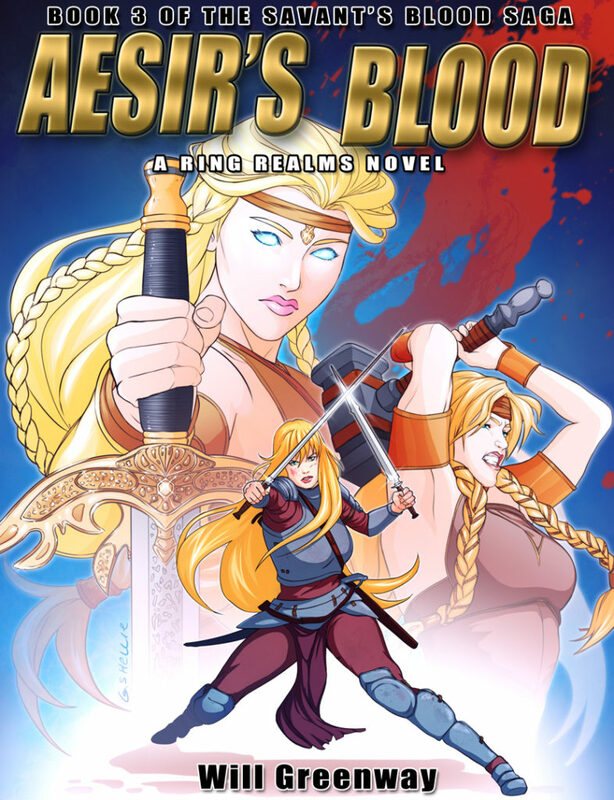 Available immediately, Will Greenway’s Aesir’s Blood, the third novel in the Savants Blood Saga set in the Ring Realms shared universe. Wren Kergatha defeats Hecate and reclaims her family, only to face new challenges. The Kriar have infiltrated Starholme, Vera her mentor in G’yaki combat, suffers a breakdown, and her grandmother Idun the pantheon lady wants to start a god war. The third installment of the Savant’s Blood Series sees Wren embrace her Aesir heritage, becoming a general like her mother and grandmother, and fighting a ground war in order to find Vera’s G’yaki clan in order to help the woman heal decades old wounds. Being far stronger and accompanied by army of allies doesn’t stop Wren’s enemies from causing trouble. She must fight dragons, gods, and even a rogue member of the firsts, before she can set matters right with Vera, herself, and her family. This entry was tagged Novels, Promotion. Bookmark the permalink.